It’s a fairy-tale nightmare . 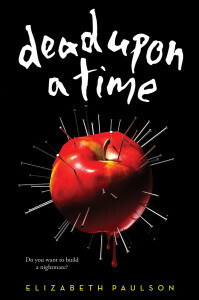 . .
One girl is kept in a room where every day the only food she’s given is a poisoned apple. Another is kept in a room covered in needles — and if she pricks her finger, she’ll die. Then there are the brother and sister kept in a cell that keeps getting hotter and hotter. . .
A sinister kidnapper is on the loose in Kate’s world. She’s not involved until one day she heads to her grandmother’s house in the woods — and finds her grandmother has also been taken. Already an outcast, Kate can’t get any help from the villagers who hate her. Only Jack, another outsider, will listen to what’s happened. Then a princess is taken, and suddenly the king is paying attention — even though the girl’s stepmother would rather he didn’t. It’s up to Kate and Jack to track down the victims before an ever after arrives that’s far from happy. And now here’s the interview! Enjoy! Question: Congratulations! Dead Upon a Time will be out in the world very soon! How does it feel? Answer: It’s a wonderful, nervous feeling to anticipate a book’s release. It’s a bit like that last hour before a first date. Question: Dead Upon a Time sounds AMAZING! What inspired the plot? Answer: I really wanted to create an adventure story focused on a brave girl surprising herself. The world of fairy tales seemed to provide an ideal backdrop for that. And I hoped to explore the idea of rescuing. I won’t give anything away, but in this book, lots of different people rescue each other. I think that happens in real life too. Question: Why do you think we’re fascinated with fairy tales? And with dark fairy tale retellings? Answer: That’s a really interesting question. As I grew up, the first stories I remember captivating me were fairytales and biblical tales. (I was raised a Catholic and my mom taught Sunday school in our home.) Both those worlds contain violence, love, vengeance, and miracles. I think we teach children about morality through both of those traditions. As we learn more about the world and the nuances of morality, we keep going back to those first lessons and reexamining them. It’s a more challenging different exercise to revisit biblical stories; they are the foundation of some people’s faith. But fairy tales allow more room for reimagining. Question: What’s your favorite fairy tale? Which fairy tale do you hope to one day write a retelling of? Answer: I love the story of Rapunzel which is, at its heart, a tale about isolation—so much a writer could do with that! When I was little, my favorite fairy tale was the story of Snow White and Rose Red. Snow White and Rose Red are sisters who are devoted to each other. They befriend a bear and find themselves helping a particularly ungrateful dwarf. In the end, the spell breaks and the bear becomes a prince who marries Snow White. And of course the prince has a brother for Rose Red. The part of me that loves this story is the same one that roots for Pippa Middleton to marry Prince Harry. Question: The title and cover for this book are epic! Who came up with them? Do you feel they fully represent the story? Answer: My editor, David Levithan, and I debated a few different titles for the novel, but kept coming back to this one. Justin Metz created the jacket art and Nina Goffi designed the jacket. I love how arresting the images are. 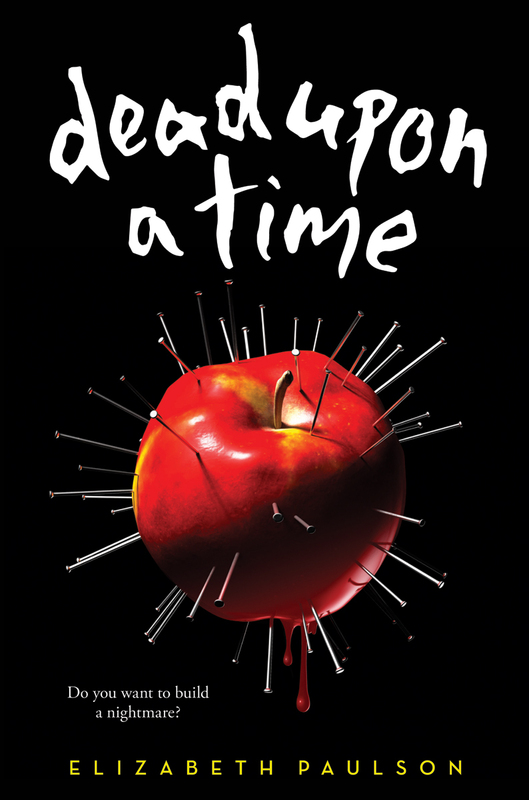 The apple references the action in the book, but just as a snapshot and I really appreciate that the cover offers this spooky glimpse into the story. Answer: I cut down the scene at Wilhelm’s castle for the sake of pacing and that was necessary. However, I lost some of the antagonism between Jack and the king. I loved that conflict because it showcased Kate’s gift of diplomacy. Ultimately, though, the scene felt like it was getting in the way of Kate’s story. Answer: After writing the book’s conclusion, I added Kate’s visions of the victims’ experiences. Those were so much fun to write and they helped hint at Kate’s emerging powers. Answer: Currently it’s a tie between the court documents related to a famous murder in a nearby town and techniques for removing copper from electronics. Question: I know Dead Upon a Time hasn’t released yet, but I still have to ask: working on anything new? Answer: I am! I’m actually moving back and forth between two projects right now—a sort of non-traditional ghost story and another mystery that has more comedic elements. I’m sorry to be so vague—I get superstitious about talking about books before writing them. But I’d love to write a sequel or prequel to Dead Upon a Time. I can be specific about that! And now for the giveaway! 3 winners will receive a finished copy of DEAD UPON A TIME. US Only. To enter, complete the Rafflecopter below! Elizabeth Paulson lives on the edge of the woods somewhere in America.